There are many countries in the world striving to obtain the green label. But Sri Lanka truly deserves to be called a green destination and to my mind, it is one of the best locations in the world for eco-tourism” said the world renowned marketing guru , Professor Philip Kotler after taking a tour to the ancient “ Sigiriya rock fortress in Sri Lanka last morning. Prof. Philip Kotler is one of the world’s foremost experts on the strategic practice of marketing, voted the first leader in Marketing Thought by the American Marketing Association. He is a distinguished Professor of International Marketing at the Kellogg School of Management of Northwestern University, and the author of many influential books. Including the 13th edition of Marketing Management. 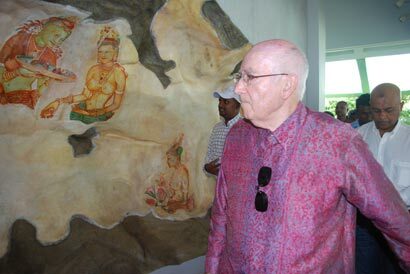 Prof.Kotler who visited the ancient Sigiriya rock fortress, referred to as the “08th wonder of the world” was taken by surprise to see how the Sri Lankan king has so strategically located his kingdom on a hard rock turning it to a palace going beyond one’s imagination. Looking at the frescoes and being charmed by the whole experience he received at Sigiriya Prof. Kolter remarked “I think the two letters “S” and “L” in the word “ Sri Lanka “ should mean “So Lovely”; which is the feeling I had visiting this wonderful landscape. Professor Kotler’s visit to Sigiriya was organized by Sri Lanka Tourism and he was accompanied by several officials in this tour including Dr. Nalaka Godahewa – Chairman of Sri Lanka Tourism, Mr.Thushara Perera-President of Sri Lanka Institute of Marketing (SLIM) and Mr. Rumy Jauffer –Managing Director of Sri Lanka Tourism Promotions Bureau. On his way back having a discussion with the officials about Sri Lanka Tourism’s Strategic Plan for next five years Prof. Kotler made the remark that “ This plan looks simple making itself very pragmatic”. During his four day stay in Sri Lanka Prof. Kotler will be delivering a “Knowledge Forum” seminar for the first time today, (6th) at Waters Edge and the seminar will focus on the importance of marketing in post recession period while discussing the methods of satisfying the need of the technology driven new generation – “Generation G”. Love kara kara indala nam hariyanne na Thumoo…! Awankawa weda nokaloth this’ll be the last chance for all of us..! Welcome back. Where have you been? Have you completed packing your bags? Big Mama is waiting for you and your fellow kallathonis who are causing problems here. Of course, after you settle down in your traditional homeland in TN, you can come back to visit us as a tourist. We will have the efficient STF accompanying you when you visit tourist places in our peaceful land. Otherwise, the women in your group may decide to press the button that triggers the bra. So Mr Kalla Pillayan, good my love. Good riddance of bad rubbish.